I have been wanting to make one of these babies for a while. Probably what held me back was an overly complex first design, complete with dovetail joints and everything. Also the timber I planned to use was not too square or true—I was planning on planing it by hand to square it up. Instead, I am planning on using some timber I bought a while ago which is square: some lovely Blackbutt. I am going to join the 3 base pieces by edge-gluing them together, then clamping, after cutting out the tenons on my table saw. Then I will, after cutting the mortices by hand, drill a hole in the tenons, and after assembly, wedge wooden pins in said holes. This will keep the joints together, and allow for a bit of flexibility in that I will be able to knock the pins out and take the thing apart for flat-packing (thanks IKEA). 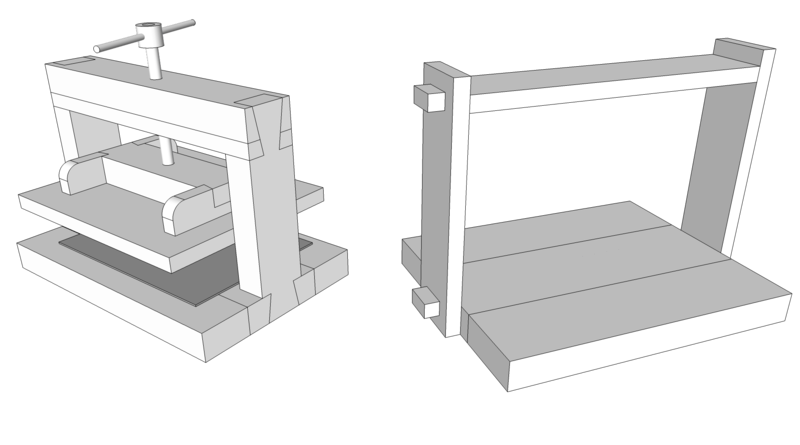 I originally wanted to use dovetails (as can be seen in the image above left) for the joints, for their strength and beauty. But I think that wedged mortice-and-tenons will work just as well, and will be much easier to make. The platen for my simple press will be simple: probably made from MDF with some Blackbutt strengtheners. I didn’t put it into the new SketchUp because I was lazy. I bought one of these shoulder vises from Carbatec, and I am going to use that for the press. I am thinking of repainting the cast bits in black.